This beautifully-restored, red-brick, Georgian home is another of Houston’s Best Kept Secrets – the Clayton Library of the Houston Public Library system (www.houstonlibrary.org/clayton). Clayton House was built in 1917 and designed by noted Houston architect Birdsall P. Briscoe. 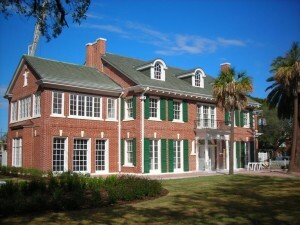 The Clayton Library complex houses the Center for Genealogical Research. Thousands of researchers from all over the country visit the Clayton Library every month. They sift through an extensive collection of US and foreign books, CD-ROM’s, microfiche, and a collection of over 5,000 family histories. There is a branch of the Mormon LDS library, and I’m told that this library is one of the best sources of historical Spanish records. Just walk into the Family History Room, and browse the stacks for your last name – chances are a book has been written about your ancestors. These family histories make quirky and interesting reading. All of us are related, to a greater or lesser degree, to princes, paupers, pastors and horse thieves. I discovered that I am a distant cousin to the bread-baking Baird family. My wife is related to three women who were executed during the Salem witch trials. It is awfully tempting to draw conclusions about our respective families – but I’ve been married long enough to know a really bad idea when it hits me! The Clayton Library is located at 5300 Caroline, in Houston’s Museum District. It is about four blocks north of Hermann Park and just four miles from downtown West U.